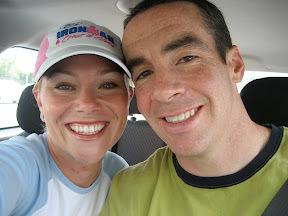 My friend Kate finished her first Ironman at Ironman Couer d'Alene on Sunday! Love the hat Kate!! It's pink!!!! I think IronSherpa Mike looks more tired! Kate was swimming around the same time Michelle and I were crawling through mud at Muddy Buddy! She was with us the entire morning! We are so proud of her!! Here is a link to her Race Report.